This is by far the most celebrated site for karsts formations in Thailand. Forty limestones islands rise 300-400 meters above the placid, pale green water of this bay. Because Ao Phangnga Marine National park is surrounded by extensive mangrove estuaries where rivers continually deposit sediment, the waters here are shallow and too turbid to support coral growth. Nevertheless, the setting is world class and thousands of visitors flock here daily to view one of Southeast Asia’s most spectacular panoramas. Unfortunately, it is not the UNESCO World Natural Heritage Site destination which draws tourists here in such numbers, but rather “James Bond Island”. It was the movie location for the Bond series”The Man with the Golden gun” which first put Phangnga Bay on the tourist map and continues to see it mass marketed today. Unless one enjoys the hustle and hassle of souvenir hawkers it is best to avoid Khao Ping Kan Island and Koh Panyi, the “Sea Gypsy Island” (actually a Muslim village on stilts) where all the tour boats disembark. In fact, it is best to experience the magic of this bay before 10.00am or after 4.00pm. Not only is the three ring circus not in session. But the low angle of the sun lends a timeless beauty to the bay. In recent years sea canoe companies have offered an alternative to viewing Phangnga Bay by private yacht or long-tailed boat. But even this softer, green approach is resulting in congestion as a plethora of canoes literally wait in line to enter the hongs and secret caves only accessible at certain stages of the tide. 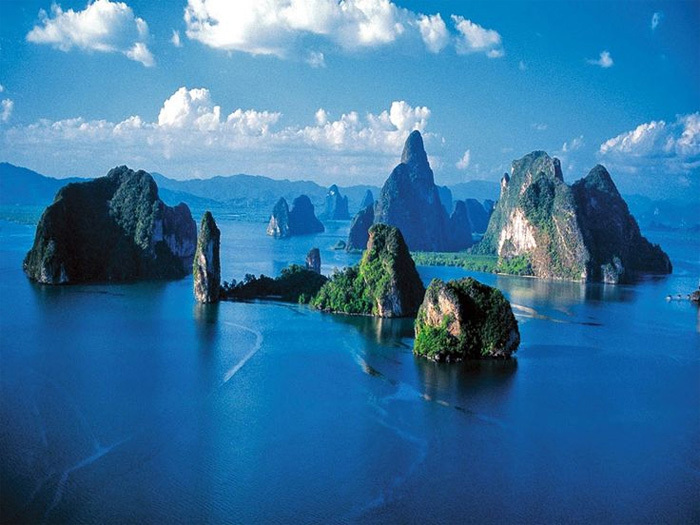 Koh Panak and Koh Hong are two of the most popularsites. Here hidden hongs, tropical Edens of flora and fauna, await the adventurer who enters by canoe oe kayak. Other features include dramatic cave-like passages: tham Lod Yai, Tham Lod Lek and Koh Talu, where one can boat beneath curtains of overhanging stalactites. Ancient rock paintings, black and ochre pictographs of crocodiles, dolphins, sharks and people, can be found on Khao Khian (mountain of writing) near the mouth of the Phangnga River. Of the 16 species of birds confirmed for the park one is likely to see many of those associated with karst islands: Blue rock-thrush, Oriental pied hornbill, Dusky crag martin, and Edible nest swiftlet. Mammals are often restricted to Flying fox and insectivorous bats on the outer islands, through Crab-eating macaques are common closer to the mangroves estuaries. Phangnga bay is easily accessed from a number of spur roads off Highway 415, r by boat of tour bus out of Phuket.